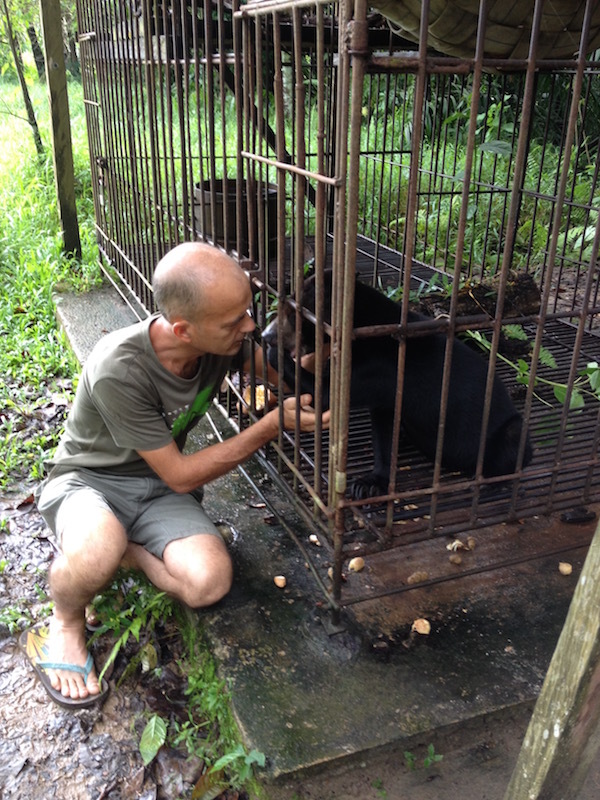 I write from Tarakan, a small town in North-East Kalimantan, where, in February, I had built wooden climbing structures and platforms in a new large empty cage for 2 female sun bears. I had also taken a young male cub called Brutus from a private owner who did not want him anymore and had introduced him to the two girls. 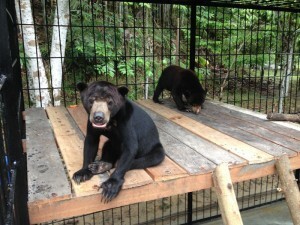 All had gone well and I had left the 3 bears together in the new 8m x 8m (and 4m high) cage. 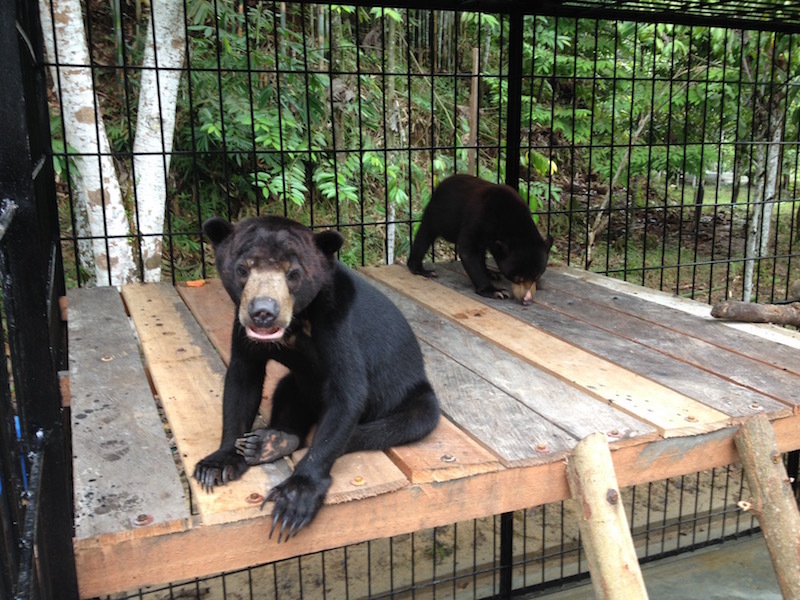 Sadly a few days after my departure the people in charge of the bears separated Brutus from the two girls because they had a fight in which Brutus was slightly wounded. So Brutus has since been alone in a small inadequate cage. When I came back to Tarakan about a month ago, I was sad to see how stressed he was, nervously pacing all day in his small cage. He suckled when I patted him, but then went back to frantic pacing at the slightest noise or movement around. Unfortunately there isn’t any sun bear sanctuary where I could take Brutus to, so I had a new cage built for him, next to that of the two girls, with a corridor linking the two cages so that we can put the 3 bears together again and easily separate them if necessary. 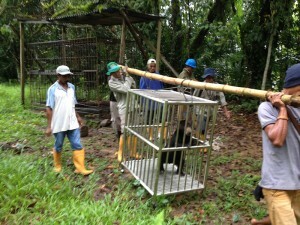 We transferred Brutus to his new 4m x 4m cage yesterday and began the introductions with the 2 girls, Rina and Fitri, right away. Brutus and Fitri, the little one, are getting along fine but there is some tension between Brutus and Rina, the bigger female. 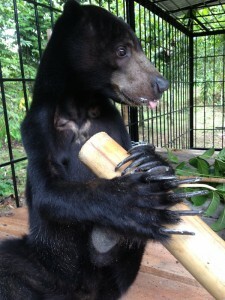 It might take some time before all 3 bears can be together but at least Brutus is much more relaxed in his new cage. I must go back to Samboja tomorrow to pursue work on my forest enclosures, but I hope the people here will continue letting the Brutus and the two girls together progressively, and that all will go well. 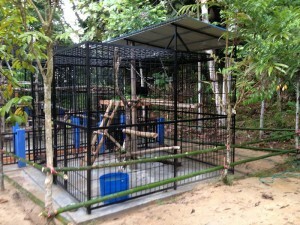 The cost for making this new cage was about 3 000 €. 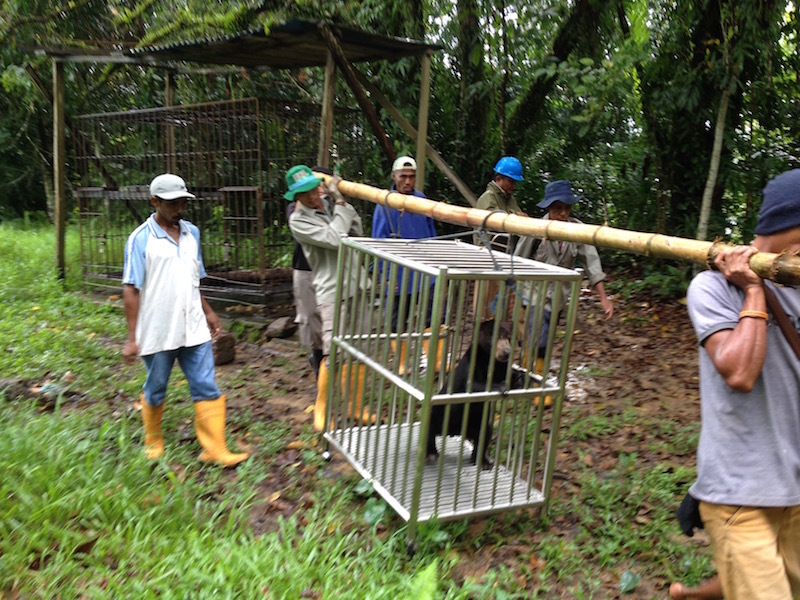 All paid for by Sun Bear Outreach thanks to your kind donations. Thank you for you support.